With Jack Ashore--The Seamen's Institute, Sydney. Title: With Jack Ashore--The Seamen's Institute, Sydney. With Jack Ashore.—The Seamen's Institute, Sydney. Much has been written by novelists and others of Merchant Jack's life on shipboard, both from the point of view of the preponderating squalor and hardship which still pervades it and from that of the now rare romance that comes in his way. But of his life during the brief spells in port and of the efforts made by kind and generous people to put a little brightness into it, and to bring home to him the fact that there are some folk at least who do not regard him altogether as a pariah and an outcast, very seldom, so quietly is the work carried on, do we hear anything at all. I purpose in this article attempting, so far as concerns our own port of Sydney, to supply the deficiency. 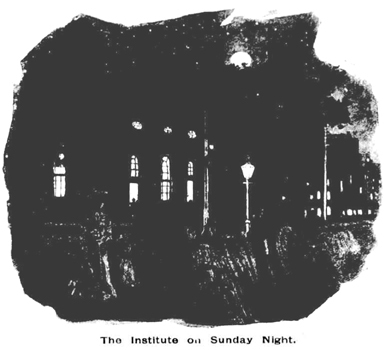 Stowed away in an obscure corner of George-street North, almost facing the wharf where lie the German-Australian steamers, stands the building known as the Seamen's Institute, consisting of a spacious club-room below; and above it, on the next storey, the Mariners' Church—capable, this last, of seating some 600 or 700 people. 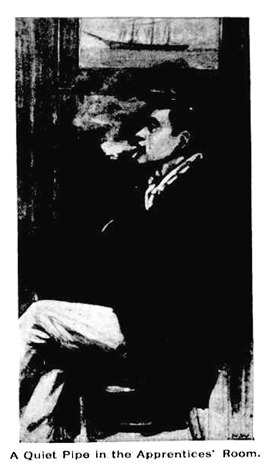 And, thus, at the Institute are Merchant Jacks' spiritual and physical needs amply provided for by those who know his nature intimately, and allow him, if he so pleases, to smoke his pipe downstairs before going upstairs to worship God; or, if he prefers it, to stay down altogether. The people who manage the Institute know Jack too well to throw Scripture at him; in consequence of which the perverse creature comes out of curiosity to discover for himself what is going on aloft, and as likely as not remains to pray. In the big lower, room Jack can smoke, read, play bagatelle and other games, such as chess, draughts, ludo, etc., and refresh himself with ''soft" drinks. There is a library (with rather a too theological tendency about its contents); there are papers and magazines by the dozen; there is everything the moderate sailor heart could wish for, except, grog, and that is, of course , anathema maranatha. 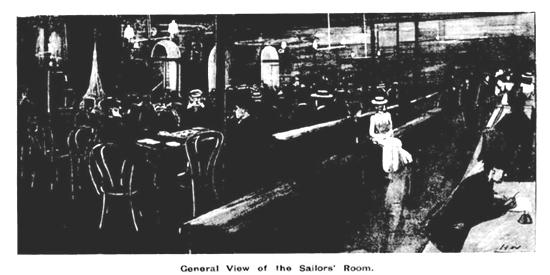 But, in addition to this fine clubroom, free to all of the seventy nine or eighty thousand Jacks who visit our port yearly, there is a regular weekly round of concerts, smoke nights, and more or less informal gatherings, some organised by the seamen themselves, others by the committee of a number of ladies and gentlemen who take an interest in, and give time, money, and thought to keep Jack straight—out of the pubs, and off the street—and in leading him to the cleanlier ways and habits of life. And to the Sydney women, especially, who year in and year out work so quietly, yet so energetically for the good of the sailor, is due not only the deepest gratitude on Jack's part, but on that of the whole community, who more or less profit by their exertions. For, be it remembered, these nights in Sailor Town don't partake exactly of the character of a society function. But that Jack appreciates them is shown by the fact that he rolled up at the Tuesday and Thursday concerts during the past twelve months to the tune of 17,185. Also 9658 of him went aloft into the church, and praised and sang, in other fashion. A very notable record, indeed, I think, considering all things. The attendances on "off nights," when there was nothing particular going on, came to 26,170. A still more startling record! Years ago—a good many—when I traded in deep-sea ships to Sydney, such a place as the present Seamen's Institute would have been a boon, indeed. I believe it was even then in existence; but somehow we never heard of it, and in consequence our evenings were either spent on board or in wandering about the streets. 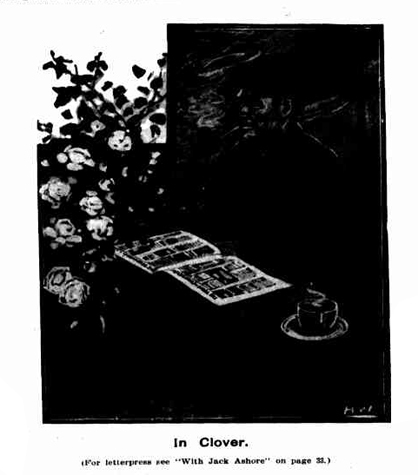 If we wished to write home, we wrote kneeling on the floor of the deckhouse, using our chests as desks. In over a dozen voyages I never remember a ship being visited and, as at present, its crew hailed as friends, and invited with hearty words of cheer to make themselves at home. We used to wash in a bucket. The sea swells of to-day go straight to the Institute, and luxuriate in a bath. And to those just off a long voyage this fact will appeal. Now, I see by one of the latest official reports, that no less than 3468 ships were visited; 4443 letters written in peace and comfort. The staff wrote 313 to its sailor friends abroad, and these responded with 368. Evidently Jack trading to and from New South Wales waters regards the institute as his headquarters. Nor are the sick seamen in hospital forgotten, no less than 676 visits during the past year having been made to the Sydney and St. Vincent's institutions. Jack doesn't forget this kind of thing. But it and the ship visiting entails a lot of work on the staff—a somewhat magniloquent term by which to denominate a chaplain and a lay missionary. Another two, at the least, are urgently needed to carry on with; but, although out of debt, the Institute can't afford to pay for more help unless contributions considerably increase. Indeed, but for the £200 per annum subsidy from the parent mission in England, of which the Institute is a branch, it would be more than difficult to make both ends meet. This strikes me as being somewhat of a reproach to the shipowners of Sydney, seeing that if the Institute can make Jack soberer, steady, and imbue him with a certain sense of religion, in fact, make a responsible creature of him, so in great measure do those who employ him benefit. And that the Institute succeeds, even with its present limited resources, in doing this its records show. And in this connection, chatting with the Rev. 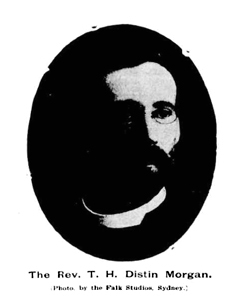 Distin Morgan, the chaplain-superintendent of the Institute, in whom the church robbed the sea of a good man, I was much struck with a suggestion he made for raising the sinews of war. This was to say once a year or so, visit the most important inland centres and lecture on the purpose and aims of the Institute. As is well known, there are "up country" many hundreds of men who once used the sea, and who now still retain for it and matters connected therewith a certain affection and regard. Recollection, mellowed by time, has preserved the pleasant memories of the life; of the long days of ease and sunshine through the Trades, when there was never need to touch a brace; of the balmy, starlit, tropic nights, when the great pile of canvas, towering heavenward, forced the beautiful fabric along almost in perfect silence; of the roaring sprees ashore "'mid shadows of palms and shining sands;" of wanderings among strange people and cities; and perhaps, above all other memories, the ever present one of the sublime and wondrous stage upon which they worked so long, and which they will never see again. Vanished is the memory of the hardship, the squalor; the rations, bad and scant; the petty tyrannies that made life a torture; all the miseries and ills of a profession unequalled in such happenings. Of many scores of sailors I have met in the bush the majority have always spoken of the old life behind them with a sort of lingering regret that must have sounded odd to those who cannot realise how the sea keeps persistently calling to the men who have once tasted of its laborious and poverty-stricken yet subtle charm. And among these—they are to be found in many walks of the inland life—it seems, only reasonable to suppose that a certain measure of support might be expected for the Jacks who still plough those "wandering fields of barren foam," who still labor "in the deep mid-ocean, wind, and wave, and oar." To those who are interested in the subject it would be perhaps a surprise to learn the number of seafarers that the great hinterland of Australia gathers yearly to its bosom. And they are always welcome. Merchant Jack, like his naval brother, is essentially a handy man and baulks at nothing, from driving bullocks to pressing wool, from lambing down a flock of sheep (if needs be in these days) to sinking post-holes or throwing a bridge across a river. And as for a horse, he is, if "all over it," but seldom off. "Have you many sailors on your station?" I once asked a squatter. "Enough to make a dog-leg fence of, thank God," he piously replied. And yet, curiously enough (to those who have never been), Jack, with all night in, full and plenty of good fresh "tucker," no hazing mates or "bucko" skippers, some of him, after a while, and suddenly obeying the Call of the Sea, goes back to it all again. Goes back to the squalid, foc'sle, and the hard living, and the broken rest; goes back to the "All hands shorten sail," the thick darkness, the howling gale, the reeling yard-arm and thunderous canvas; goes back to face the music because of that little indefinable something tugging at his heart-strings, calling him so irresistibly. But, again, many remain and resist; and to these a mission of the kind proposed by the chaplain might not be unproductive. Saturday night has been from time immemorial generally looked upon by Jack as one of liberty and freedom, on which to spend the few shillings doled out to him from his pay. And yet so successful have proved the "socials" introduced by Mr. Morgan on that apparently most hopeless of all nights, that on 52 Saturdays the attendance numbered 7200—all Jacks, and their five shillings, saved from the low bars and lower harpies of Sailor Town. 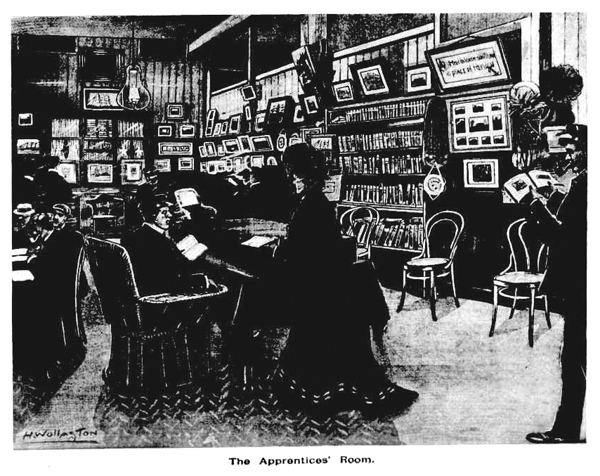 A feature of the Institute is the "Apprentices' room," a large apartment, comfortably furnished throughout by the hon. secretary, Mrs. Scot-Skirving, than whom nobody takes more interest in seamen, big and little, body and soul. And here the youngsters can write letters, read, exchange opinions on their respective ships, smoke if they wish to, or make arrangements for running away up country to dig for gold or shoot the bushrangers, with which that terra incognita still teens. The last year's report states that out of 445 apprentices who visited Sydney 10 deserted. But of these, 4 were persuaded to rejoin their, ships, 3 were sent home, 2 went on the coast, and 1 has left no trace. Respecting that solitary and errant youth is much field for conjecture! 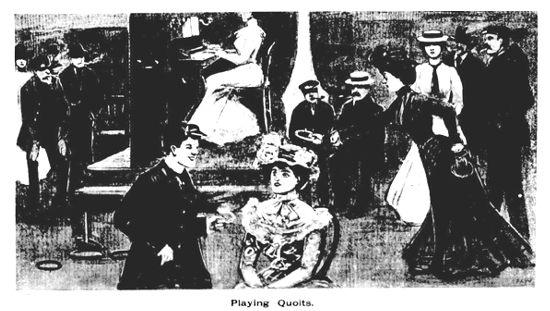 A notable feature in connection with the apprentices is that, as occasion serves, they are introduced to the ladies of the committee, and by them taken home, and once more made acquainted with the comforts and amenities of that other home so far away, and perhaps so longed for. And what such a privilege means to a little "first-voyager" only the lad himself can realise. That they are not ungrateful, the walls of their room bear ample testimony in framed pictures of ships, nicknacks, and curios presented to the Institute. 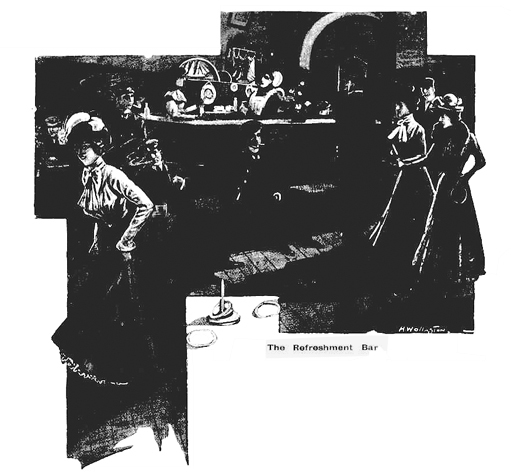 Monday night is made an "at home" by the ladies for this especial purpose of seeing the lads and talking with them, and, as remarked above, offering them such hospitality as they could find nowhere else apart from their own relatives and friends. Lucky "brass-bounder" of to-day! Changed, indeed, are the times since, when with other youthful "hard bargains" the writer tramped the cobble-stoned streets of Sydney and waited vainly for gracious ladies to appear offering cates and boundless hospitality to the forlorn children of the sea, strangers in a strange land. 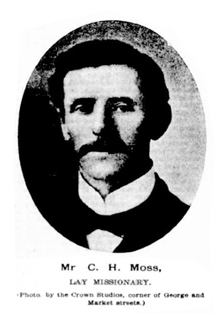 But now, thanks to the exertions of the ubiquitous and energetic lay missionary, Mr. C. H. Moss, no visiting ship remains unboarded, and all hands are cordially invited to the Institute to spend their evenings. 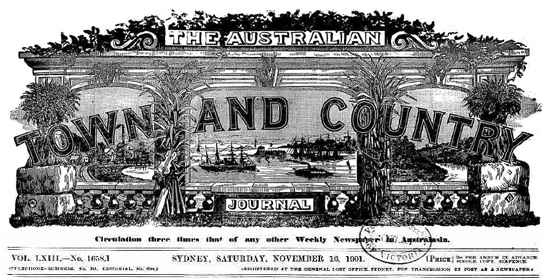 Recently there came to Sydney on a tramp steamer an Ordinary Seaman of no common parts, who, when he returned home, wrote the story of his experiences. He called his book "The Shuttle of an Empire's Loom," and told his story well. 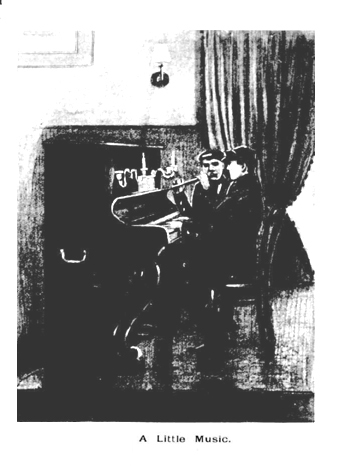 Also, he has a long reference to the Institute, describing a concert he was present at, and concluding as follows: "Would that some of the other bodies who profess to take an interest in the welfare of the merchantman had as much knowledge of the correct way to set about it as the Sydney Sailors' Institute." 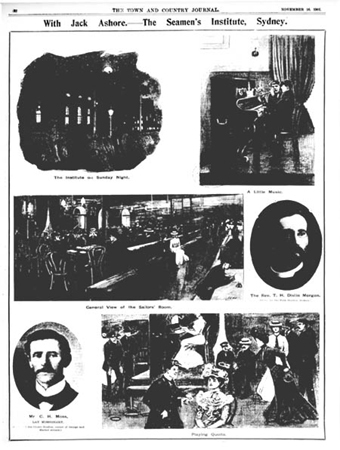 The author also expresses his thanks for a bag of "Strand" and "Pall Mall" magazines, "Illustrated News" and "Graphics," "which passed many a weary hour at sea." Scores of these neat bags, filled with reading matter invaluable to Jack in his watch below, are yearly placed on outward-bound ships by Mr. Moss, for whom the arduous work of visiting is, as the trade of the port increases, getting to be quite too much. As remarked before, to allow such an institution to remain short-handed for lack of a few extra pounds per annum, is a reproach to the Sydney shipping community, many of whose names are conspicuously absent from the published list of subscriptions. In a measure, perhaps, as far as the general public is concerned, the Institute has only itself to thank for any want of support it may have experienced. It doesn't advertise; it doesn't send round canvassers; it simply, so to speak, sits still, and trusts in Providence and the shipping people, which ought, of course, to suffice. Only, unfortunately, it does not. Hundreds, nay thousands, of out-siders have a soft place in their hearts for Jack, and a spare shilling or two in their pockets for his benefit. And these are the people who might very well be asked to supplement the offerings of the regular subscribers. As it is, the Institute is doing valuable work; but it might be made to do much more, and do it better. Space is urgently required to meet the ever-growing number of visitors. On hot summer nights, when the rooms are uncomfortably crowded, there is nowhere for perspiring Jacks to escape except on to a little narrow balcony or out into the street. The lavatory accommodation, too is becoming insufficient. There are also other matters; and take it full and by, the place, despite the incalculable good it is doing, even with its scanty funds and congested space, is not a credit to one of the greatest shipping ports in the world. In the near future it will be ridiculously inadequate to its purpose, and if something be not done, Jack will overflow into the streets and public houses. Of course the executive fully realise this fact; but it is helpless without ampler funds to draw upon than it at present possesses. Glancing over one of the later subscription lists, it is significant to remark that, the whole of the ship collections, amounting to £113 5s 2d, is contributed, without exception, by regular traders to the port. Apparently the scores of strangers who visit us yearly have given nothing, which shows, I take it, the need for more help—in Mr. Moss's department especially. It seems only fair that these nomadic vessels, availing themselves of the advantages of the Institute, as we know they do, should be invited to contribute to its maintenance. Of interest also is it to note that among the thirty odd contributing steamers on the list appears only a solitary sailer—a fact which but emphasises the above remarks, inasmuch as on most nights representatives of canvas may be met with at the Institute. Mr. Moss should have, at the very least, two colleagues to help in the work of visiting and collecting. 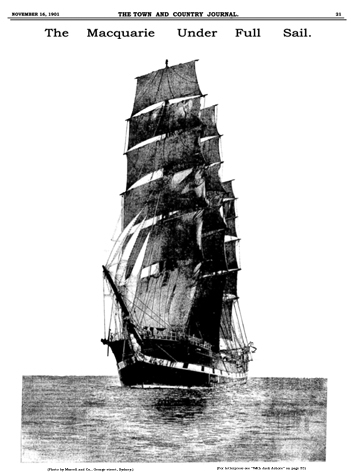 And, talking about sailing ships, the master of the Macquarie, the late Captain Goddard, was one of the best friends the Institute had; ashore or afloat he ever took a sympathetic and practical interest in its fortunes. And now, although he has gone far beyond the "long wash of Australasian seas," which his noble ship cleft so surely and so regularly, yet is his memory kept green in many hearts of seamen and landsmen. The Institute could do with many more friends like the old master mariner of the Macquarie. It is hardly necessary to say that all Merchant Jack does not spend his evenings rationally and soberly at the Institute. Some of him still goes on in the bad old way. With him, however, we have nothing to do just now. But to the majority—the great majority—it may be safely said that the quaint old building snugged against tall warehouse walls, grimy with steamer smoke, and practically unknown to thousands of city people, has proved a very present help, a certain harbor of refuge. And the purpose of this article has been not only to draw attention to that fact, but to attempt to enlist the sympathies of the public at large, both in town and in country, to such an extent that the scope of the work shall be enlarged and opportunity afforded those willing to assist Jack ashore, which is where he really needs it, even more than when afloat.